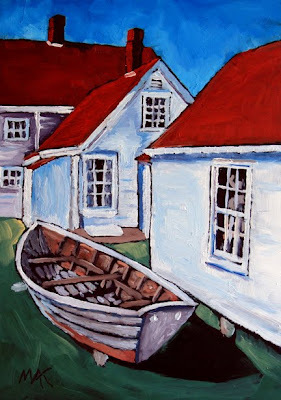 A very famous scene on Monhegan Island in Maine, you have all probably seen it a hundred times. It was fun to do my version, would like to do a large one someday. Love this! Those reds really pop, Mary Anne. Your background in graphics shows here, love it! Love the composition in this one, and the bold colors. You have managed so much on a small scale! Wish I could see this land mark in person. Looks like a great place.